Whenever you hear the word “three dimensions”, what is the first thing that comes to mind? If you thought about movies, you are absolutely right! In this day and age, 3D is almost synonymous with animation and movies but did you know that three dimensions can also be applied to tattoos? Yes, there is such a thing as 3D tattoo design and we are here to introduce you these wonderful pieces of body art. In this article, we will be introducing you to the 3D tattoo world and how awesome it would be to have one. We will show you a variety of 3D tattoo designs that will definitely urge you to have one inked on your body. We will also be discussing here the perfect designs for your future 3D tattoo and the body placement you can make that will especially give this stunning tattoo the extra “oomph”. 1 3D Tattoo: What’s so special about them? 4 How Painful Is A 3D Tattoo? 3D Tattoo: What’s so special about them? Contrary to what tattoo artists often say, any design can be turned into a 3d tattoo if the tattoo artist you have has the guts and creativity to make one. Since the 3D tattoo is now slowly dominating the “traditional tattoo” design market, more and more tattoo artists are somehow forced to adapt their once flat traditional tattoo designs into 3D tattoo designs because of the demand. Now, a plethora of tattoo artists can do 3D tattoo designs because of the pressure made by the tattoo enthusiasts. Here are some of the most famous or common 3D tattoo designs for lads and gals. Since the body art industry, most specifically the tattoo industry, has long been dominated by male clientele, it seems only natural that a good chunk of 3D tattoo designs out there are specifically made for men. From the good old classic skull tattoo design to the somewhat modern steampunk tattoo, a sizable amount of tattoo designs are available for men compared to women. The skull is one of man’s oldest and most powerful symbols. It has a long and varied history of use with multiple overlapping interpretations. Most commonly it is seen as a representation of death and mortality. There are a lot of designs for skull tattoos out there. From the traditional skull tattoo to the newer watercolor skull tattoo, the skull tattoo has continuously morphed itself to fit with the times. Despite these variations in design, the main focus of this is 3D tattoo designs of a skull which blossomed way earlier than what you think. They are actually one of the earliest 3D tattoo designs out there if memory serves correctly. 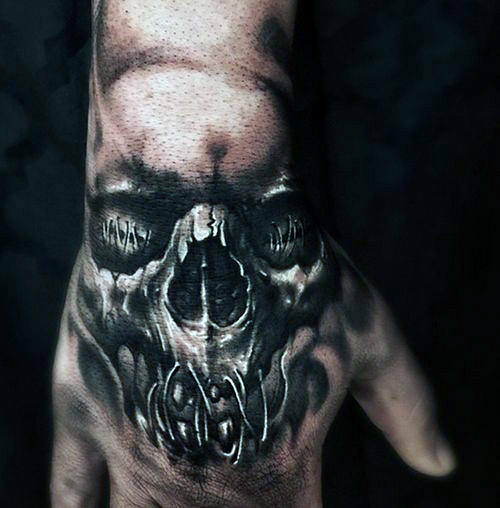 A full hand 3D tattoo of a skull with high detail. 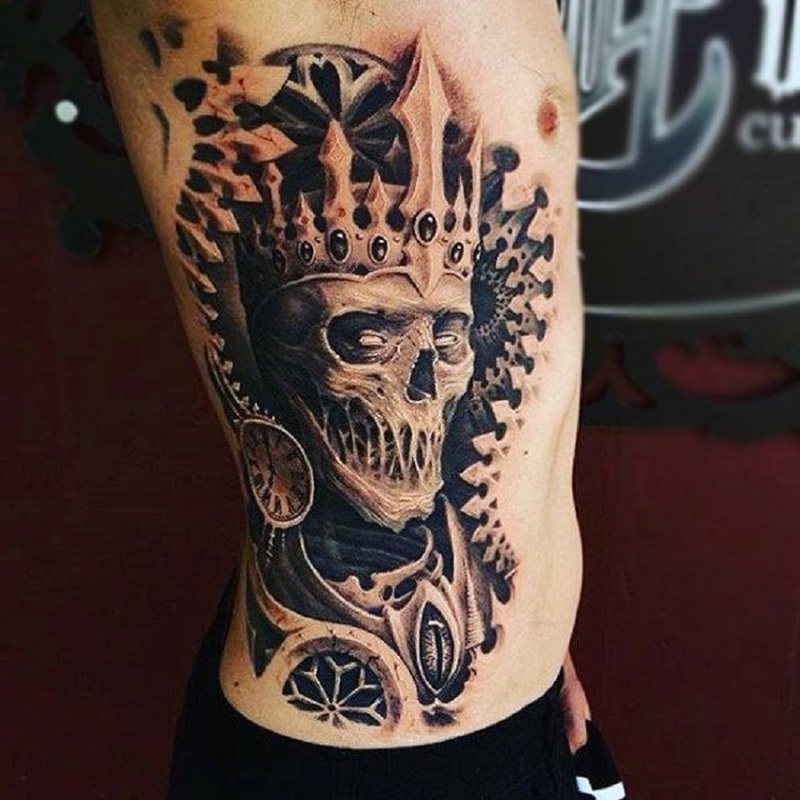 A highly detailed and embellished three dimensional skull tattoo inked on the rib cage. 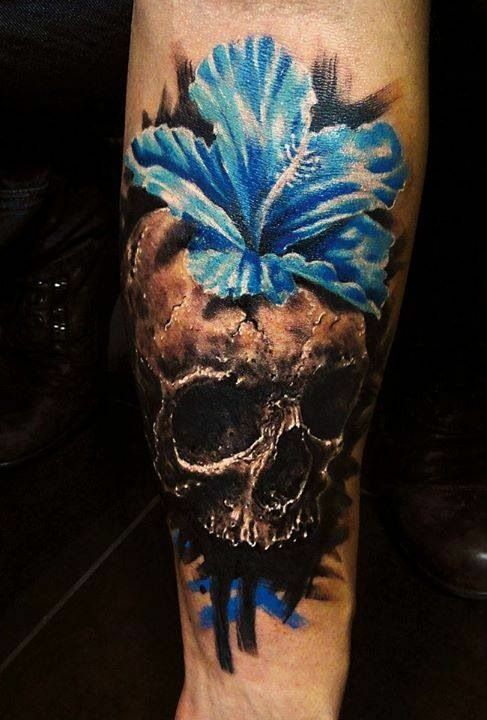 A three dimensional tattoo of a skull with a blue hibiscus flower. 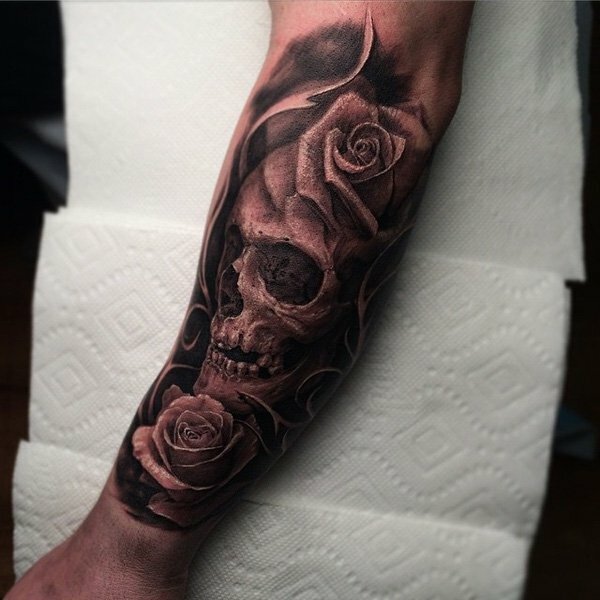 An intricately designed 3D tattoo of a skull with roses. 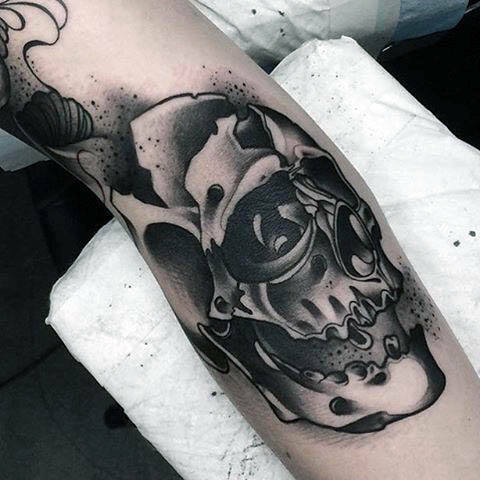 A non-colored neotraditional skull tattoo with additional thee dimensional tattoo elements such as shadows to give that overall 3D tattoo vibe. The compass tattoo design may be considered new by some but in actuality, this one is way way older than it looks. Compass tattoos actually originate from the Spanish Conquistadors when they ventured to the old world. It is said that the tattoo would guide the conquistadors to safety. 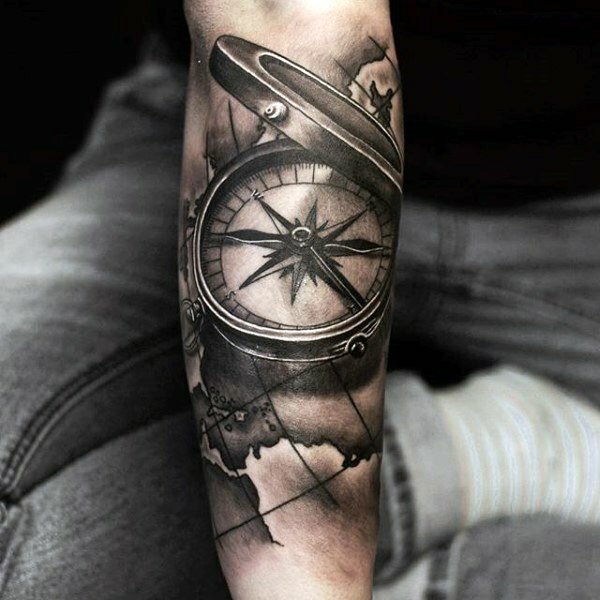 In today’s day and age, the compass tattoo is not exclusive anymore to the conquistadors of Spain or the seamen of navies but is now a widely accepted tattoo design for individuals with an adventurous spirit. 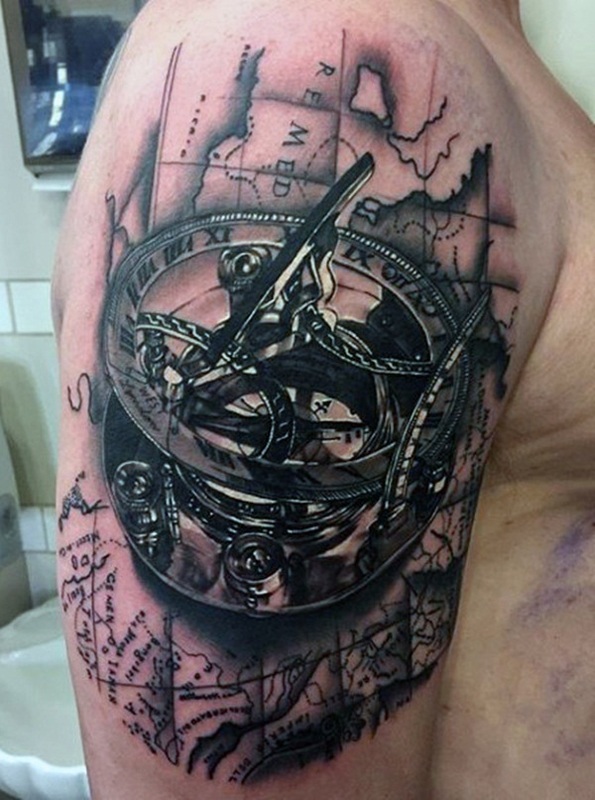 An intricately designed old compass three dimensional tattoo with a map as a background and ropes as additional detail to finish. A very old style compass tattooed in three dimensional style with a clock behind it. 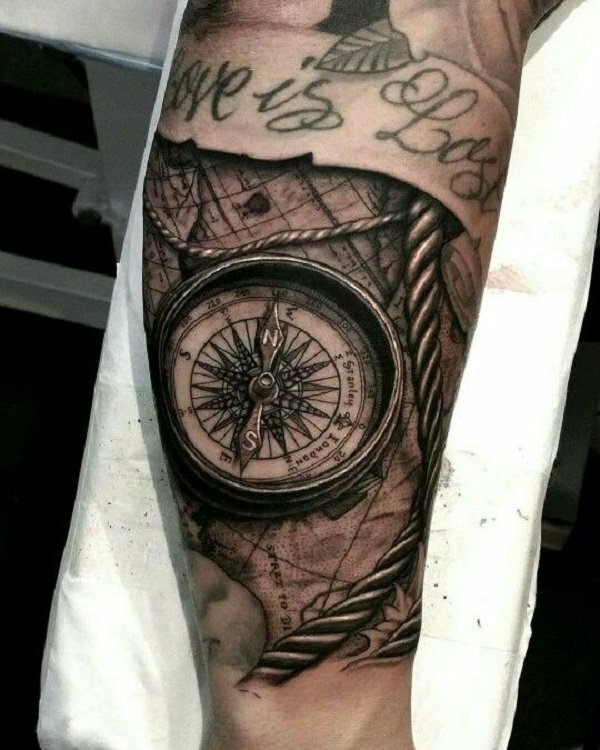 A very complex and intricately made three dimensional compass tattoo on the upper sleeve or rather, the upper arm portion of the body. 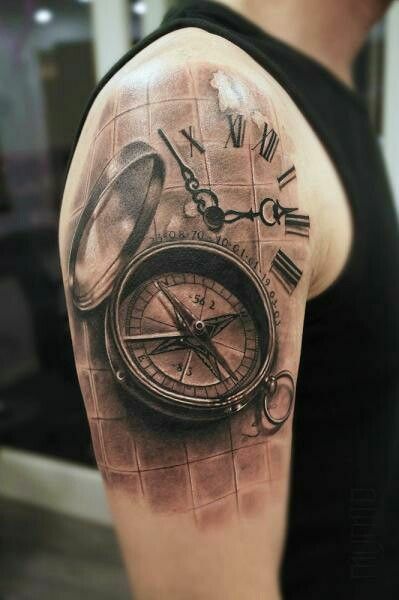 An old compass 3D tattoo masterfully designed to have a pseudo reflective quality inked on the forearm. 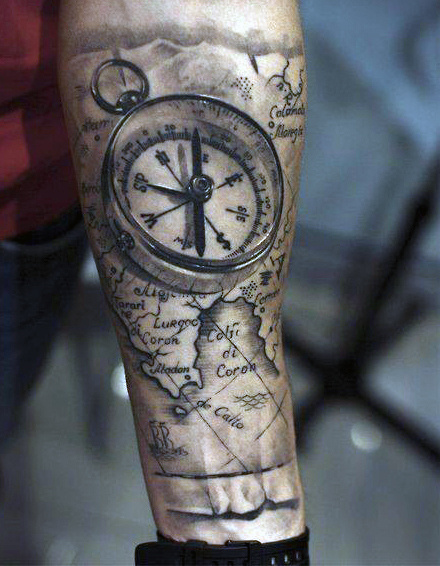 A fancifully made three dimensional compass tattoo inked on the arm with a map as a background. 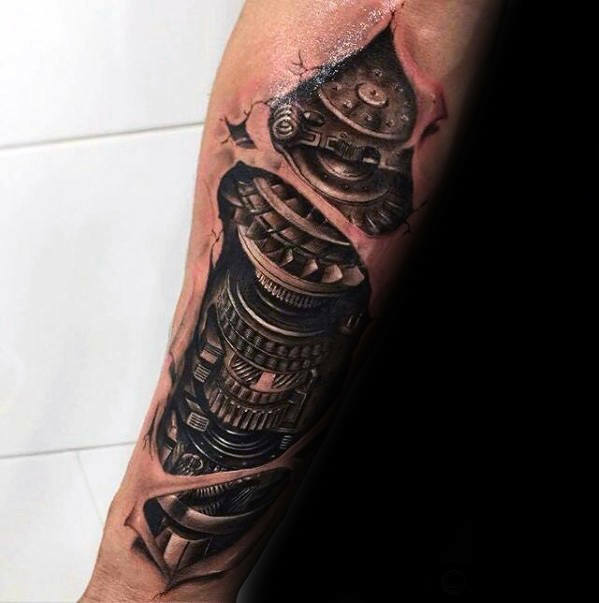 As for the 3D tattoo design that was made inspired by this subgenre of science fiction, this tattoo will always have that distinct “old machinery” look to it. It would not be called steampunk if not because of this specific look. Although the design is still in its infancy when it comes to popularity, it is now slowly gaining traction as more and more tattoo artists and tattoo enthusiasts are being drawn to this uniquely conceptualized tattoo design. 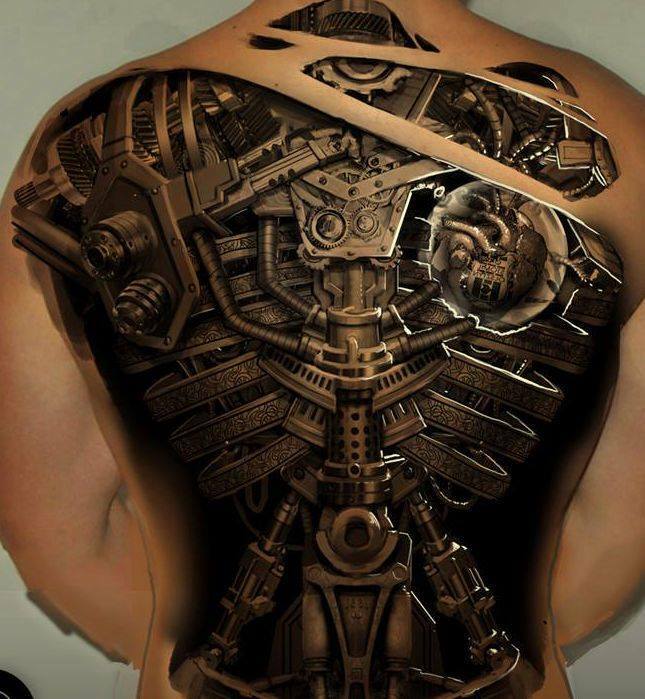 A masterfully crafted and highly detailed three dimensional full back tattoo of various machine parts such as metal rings, springs, and other common parts that forms a steampunk design of a robot’s inner workings. 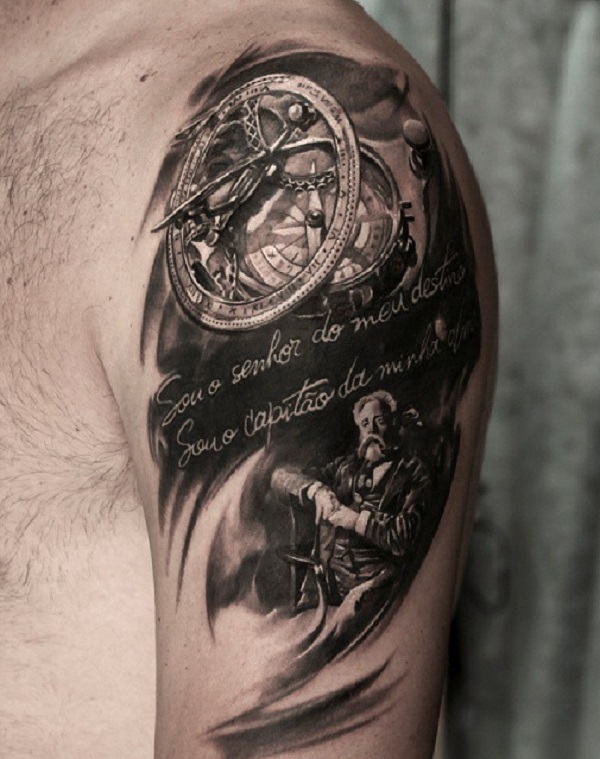 An upper sleeve tattoo of a three dimensional steampunk clock and compass. 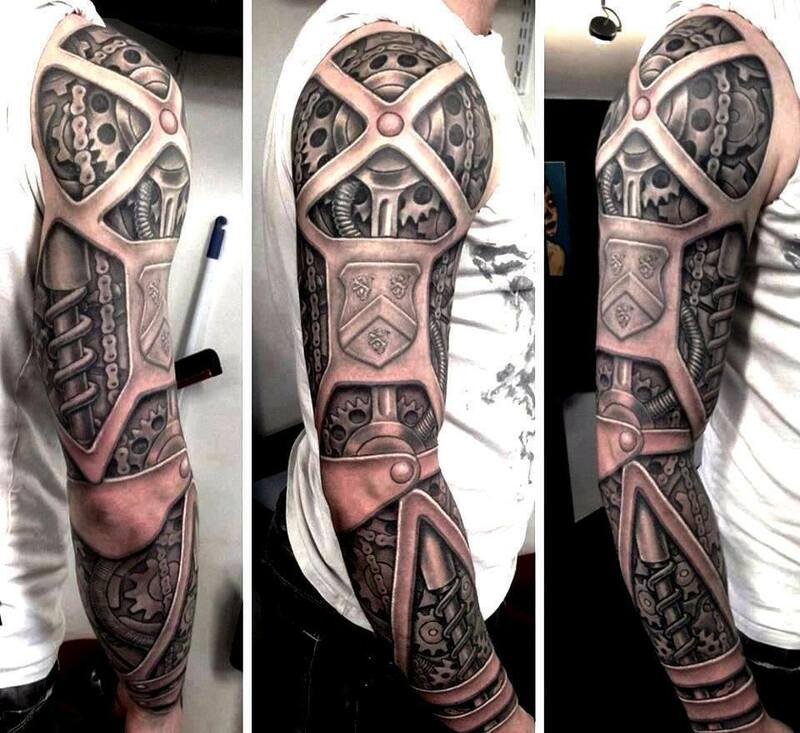 An intricately made and highly detailed full sleeve three dimensional tattoo design that is clearly inspired by steampunk designs. 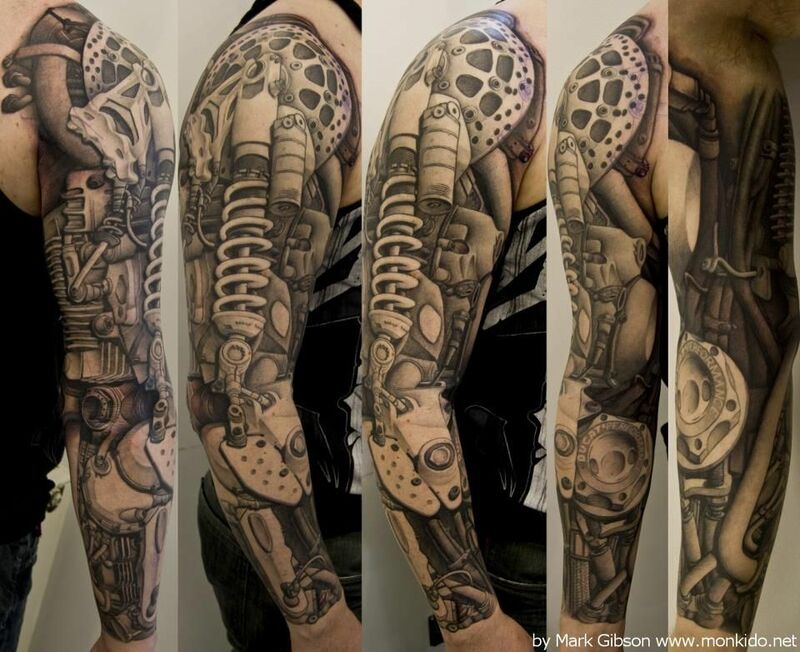 A full sleeve three dimensional steampunk tattoo with different machine parts such as pistons, cogs, and wirings to form a design of a bionic arm. An awesome steampunk tattoo of chains and coggs inked on the sleeves portion of the body with additional three dimensional tattoo design elements to further accentuate the overall design and increase its visual appeal. It has only been in the recent decades when women began having three dimensional tattoo designs on their skin since there are only a few tattoo design options for their gender back then. Nowadays, however, the female clientele of 3D tattoo designs are now almost equal to men which pressure tattoo artists to formulate new designs that will compliment a woman’s figure and their standard of fashion and beauty. Although still not that many if compared with the choices for men, the number of designs are growing which is a pretty good sign for everyone. Flower tattoos had always been a staple for feminine tattoo designs since the beginning of women tattoos. A lot of different kinds of flowers pop up in the tattoo world trying their best to mimic reality. This mimicry thus resulted in the 3D flower tattoo design that women all over loved and cherished. 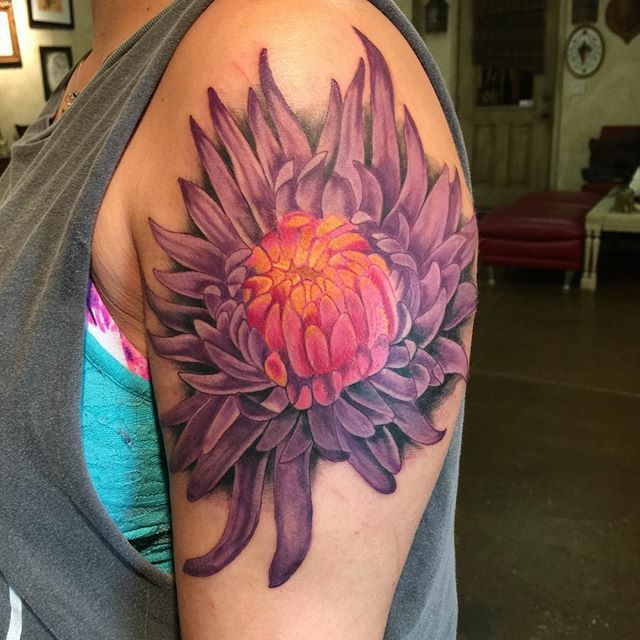 A huge variety of flowers are now being adapted to three dimensional tattoo that we now can barely keep track of which is why we grouped all three dimensional flower tattoos under one category. 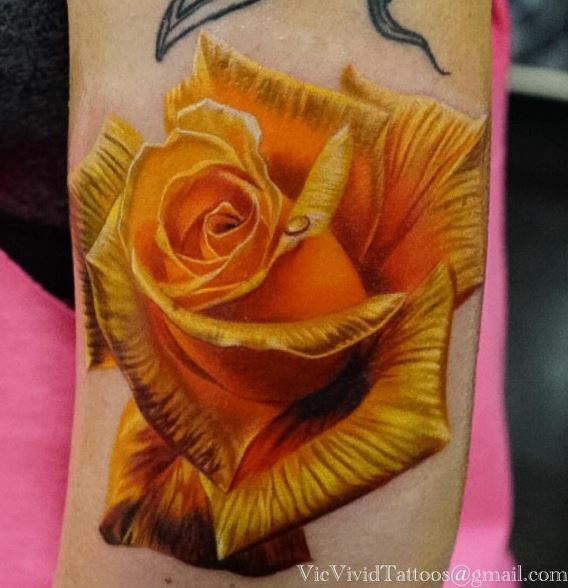 A highly detailed three dimensional tattoo of a yellow rose that has been exquisitely made to mimic a real yellow rose. 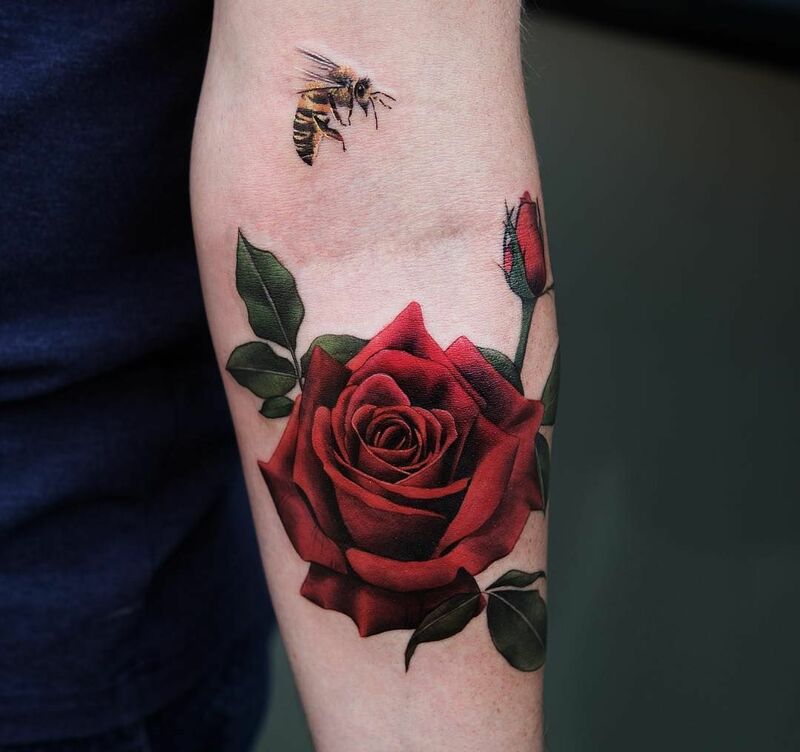 A beautifully made three dimensional tattoo of a vibrantly colored red rose with a bee. A purple colored chrysanthemum tattoo on the upper sleeves area of the body with additional shadows to make it three dimensional. 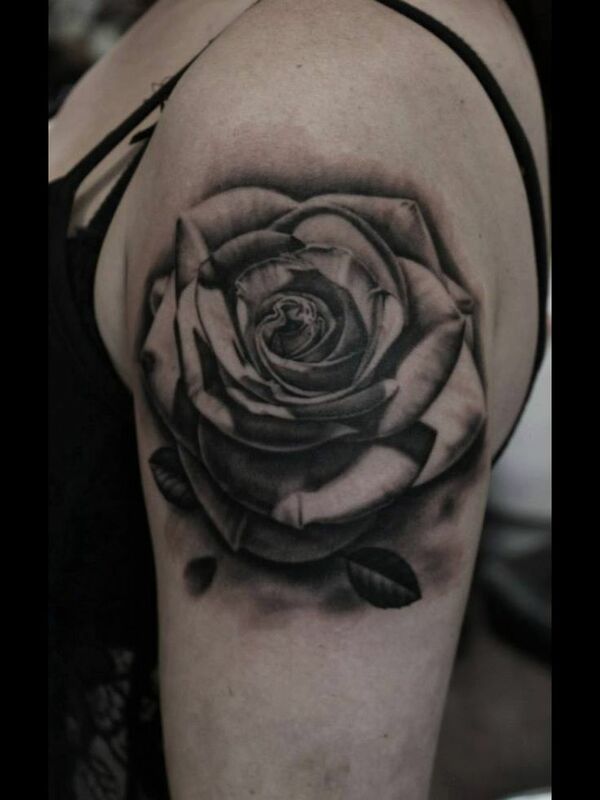 A three dimensional tattoo of a rose inked on the upper arm or upper sleeves part of the body. 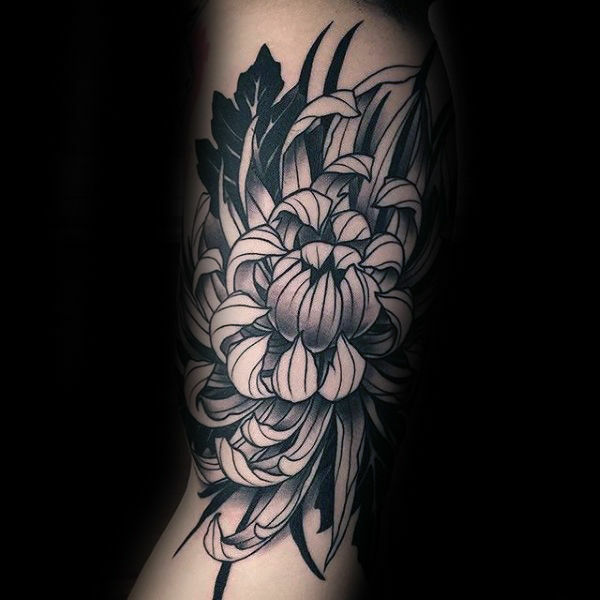 A neotraditional non-colored tattoo of a chrysanthemum with three dimensional tattoo detailing added to the design to make it a 3D tattoo. 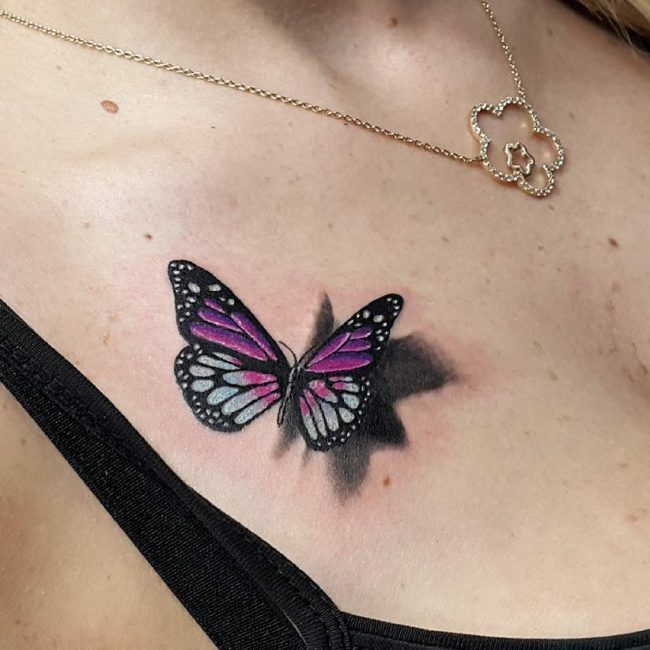 Since the dawn of feminine tattoos in the modern age, butterfly tattoo designs has been one of the mainstay designs for women and for a time, the only design available for them. Butterflies are often associated with femininity and beauty which is why they were first used on women as a tattoo design. Despite this apparent constraint in feminine tattoo designs, women learned how to be creative and thus made a lot of variations from the simple and traditional butterfly tattoo designs we know of. 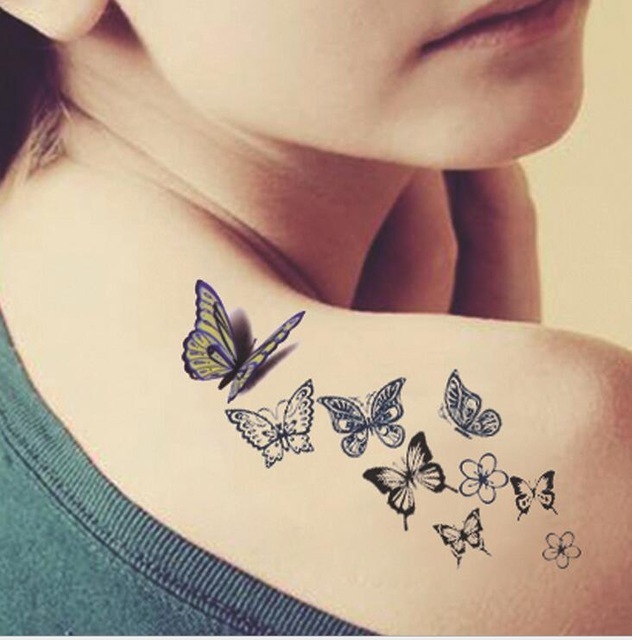 One of the products of their creativity was the 3D butterfly tattoo design which is very famous right now as the option of most women whenever they will get a butterfly tattoo for their body. 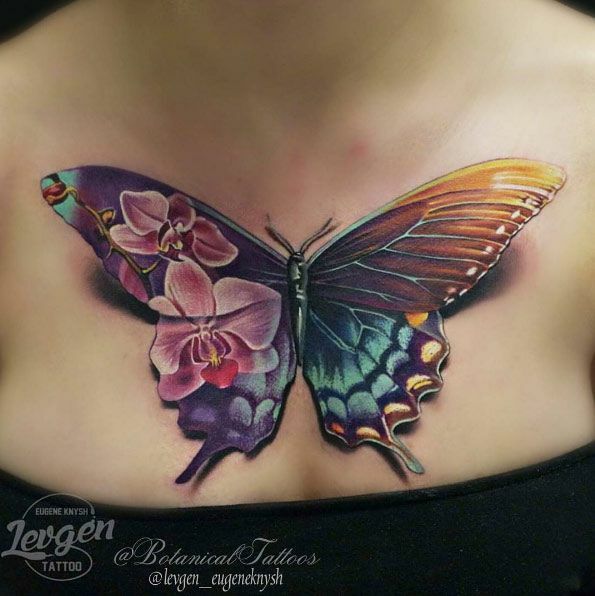 An artistically made large chest 3D tattoo of a butterfly with shadows. 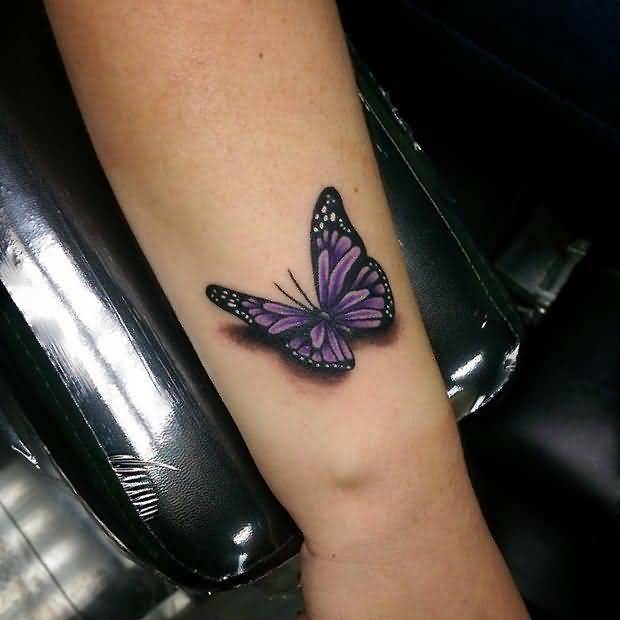 A small but highly detailed purple butterfly tattoo on the arm near the wrist with shadows to evoke the usual or typical three dimensional tattoo vibes. Another purple butterfly tattoo on the chest with three dimensional tattoo design aspects added to it. A highly detailed tattoo of butterflies on the shoulder with one tattoo as a three dimensional tattoo of a butterfly. 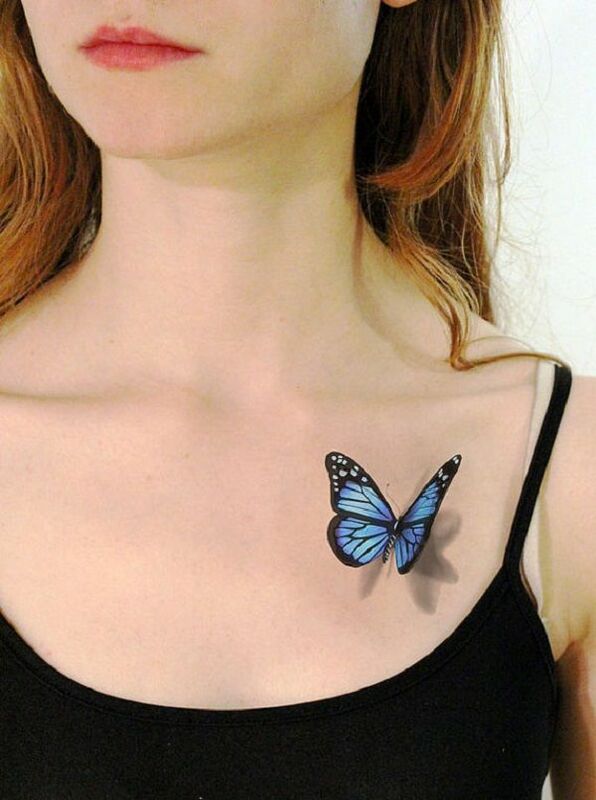 A realistically detailed three dimensional chest tattoo of a blue butterfly with additional shadow elements. The feather has always been a symbol of intellect and wisdom since the dawn of time. Which is why it has also been used as the writing material before the advent of better writing techniques such as the pencil and the pen. 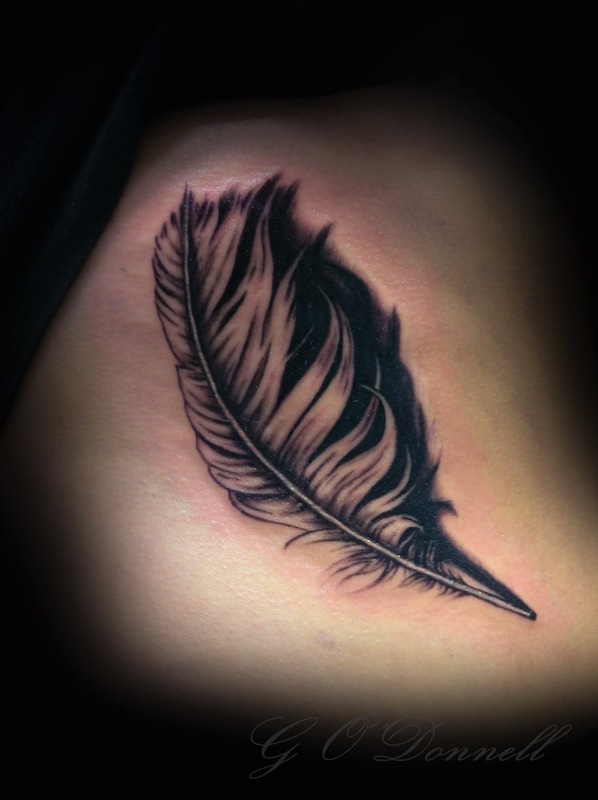 The 3D tattoo of a feather also holds the same meaning to everyone in the tattoo community. 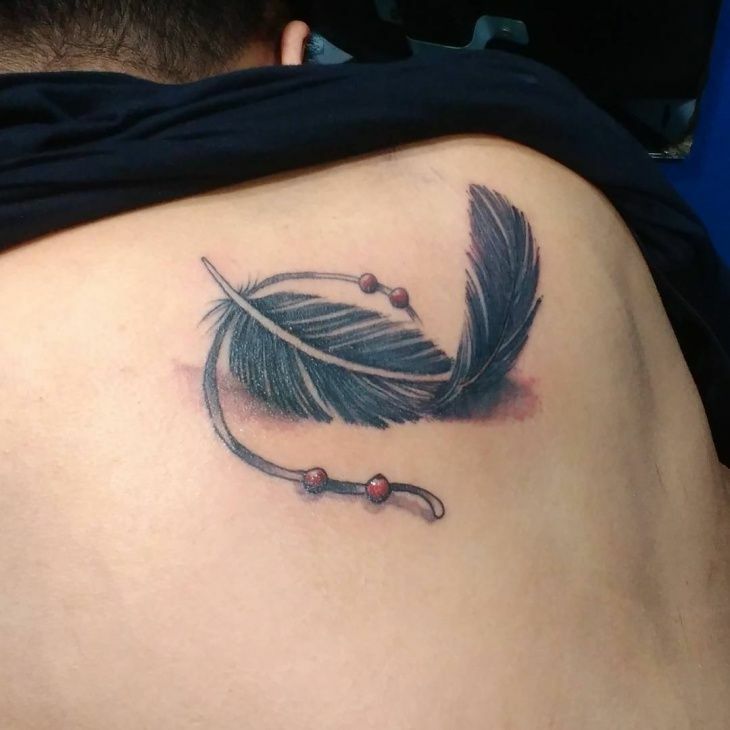 Having a feather tattoo be inked on your skin is a sign that you crave for intelligence and wisdom that will guide you through life’s obstacles. Women, in particular, are more drawn to this tattoo design more than anyone. 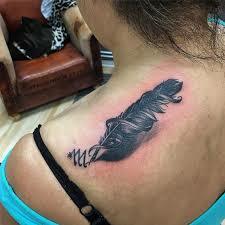 A moderately sized feather tattoo on the back with shadows as a way to make the tattoo three dimensional. A wonderfully made and intricately detailed three dimensional tattoo of a feather. 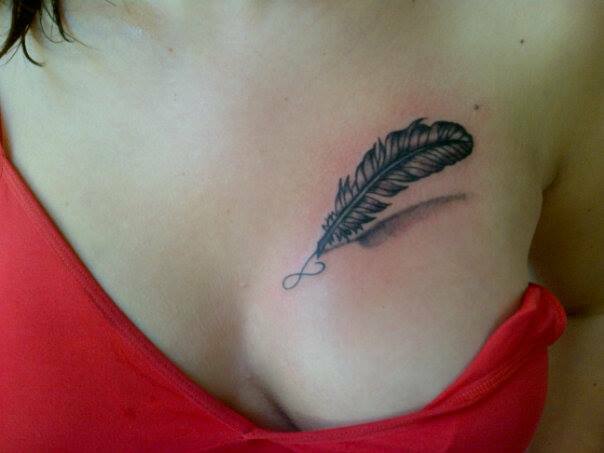 A freshly inked highly detailed three dimensional tattoo of a quill tattooed on back near the shoulders. A 3d tattoo on the chest of a quill writing an infinity symbol. 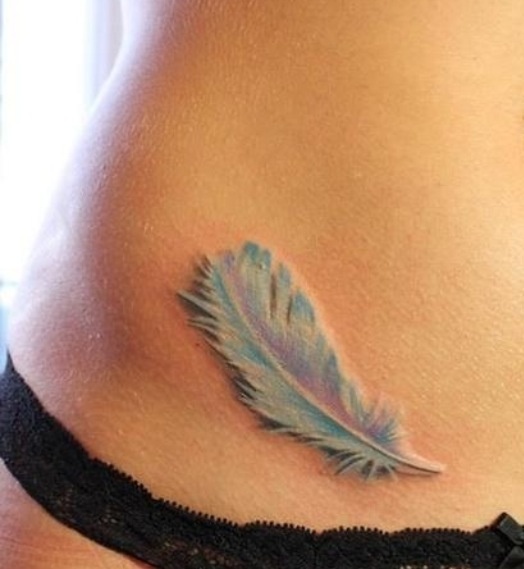 A pastel colored blue feather tattoo that is made as if it is embossed or engraved to the skin. To be completely honest, we have no idea what is the “perfect” body part for this tattoo style to be inked to. Since 3D tattoo designs are more of a general tattoo style where any design can be turned into a 3D tattoo. The sleeves part of the human body is probably the most famous body part used for 3D tattoo designs for both genders. Why do you ask? Sleeves are one of the largest areas a tattoo artist can work on which gives the design more freedom to take form. Aside from this, a large part of the skin on the sleeves is thick which makes it the best tattoo placement for new tattoo wearers. 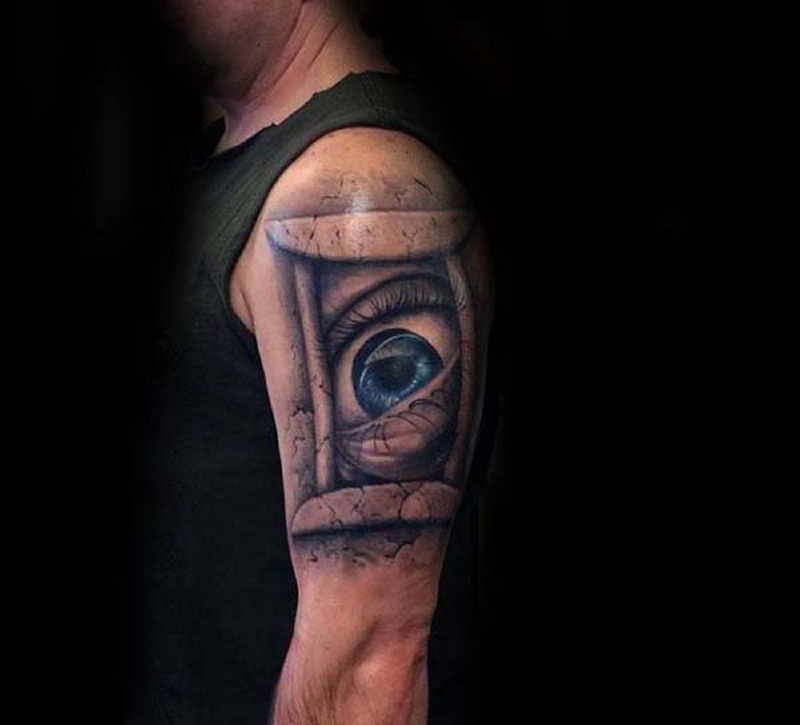 A three dimensional tattoo of an eye peering through some sort of window inked on the upper sleeve. 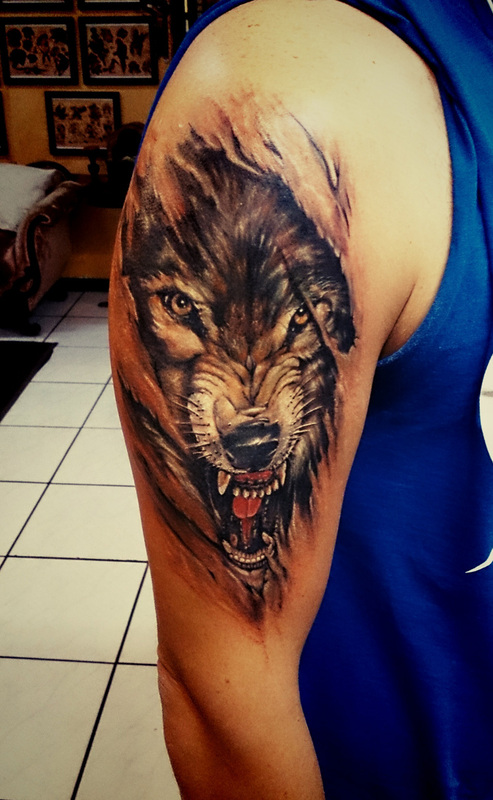 A three dimensional highly detailed upper sleeves tattoo of a wolf peering through ripped skin. 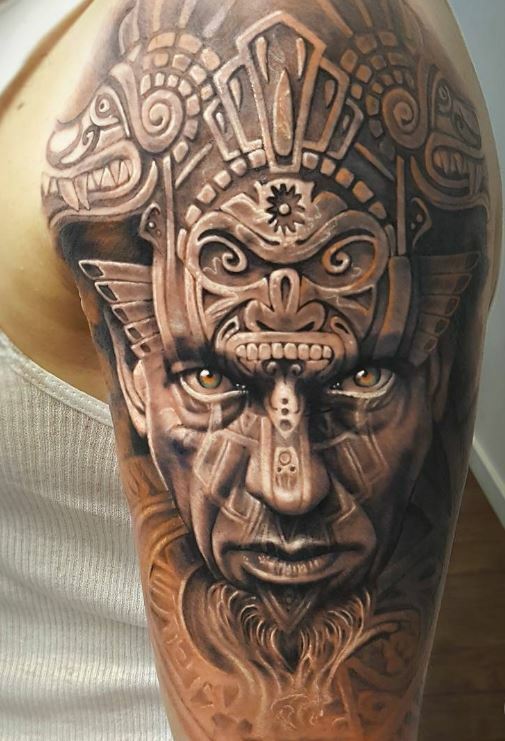 A very intricate three dimensional tattoo of a well decorated Native American warrior o the upper sleeves portion of the body. 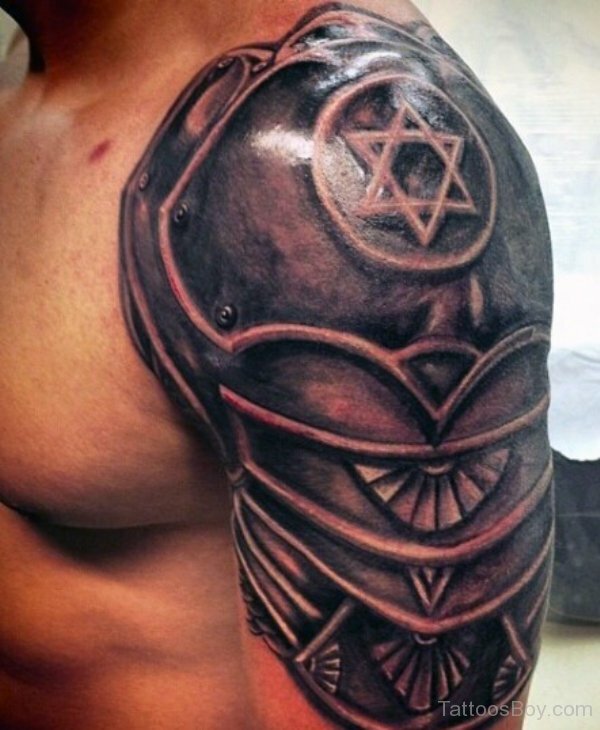 A large realistically detailed shoulder armor tattoo inked on the sleeves with 3D tattoo design elements to make the design “pop”. 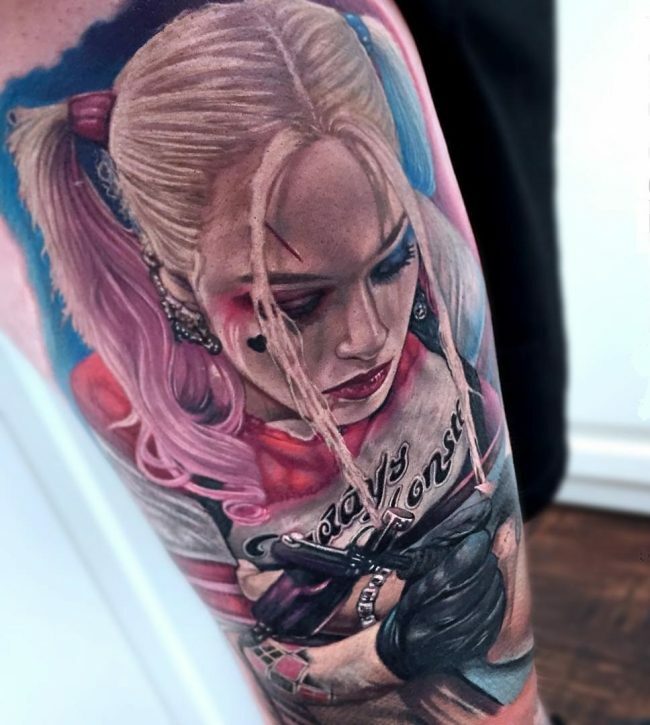 A colorful tattoo of a Harley Quinn inked on the sleeve. The forearm part of the human body is also one of the most famous body part used for 3D tattoo designs for both genders. This is the most common spot where new tattoo wearers ink their freshly minted tattoo designs since the skin here is thick which makes the tattooing process bearable. In addition to low pain levels in this area of the body, it is also considered one of the best places to put a tattoo by tattoo artists because you can vividly show everyone in the public your tattoo. 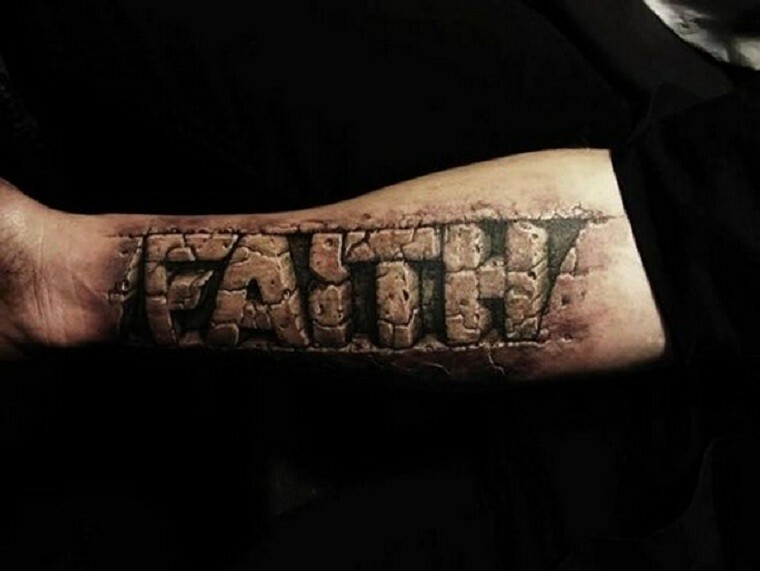 Since we are talking about 3D tattoo designs, you might as well brag about it. 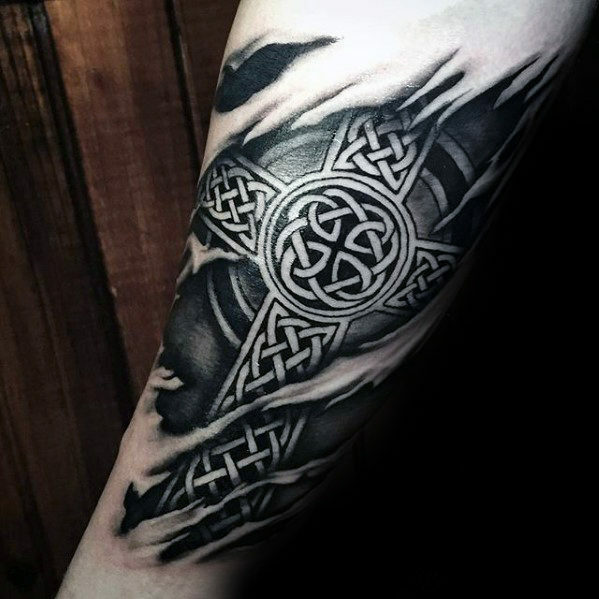 A highly detailed three dimensional forearm tattoo of a Celtic cross with ripped skin design elements to make it more three dimensional. An intricately made three dimensional tattoo on the forearm copying the vibes of a word carved from stone. 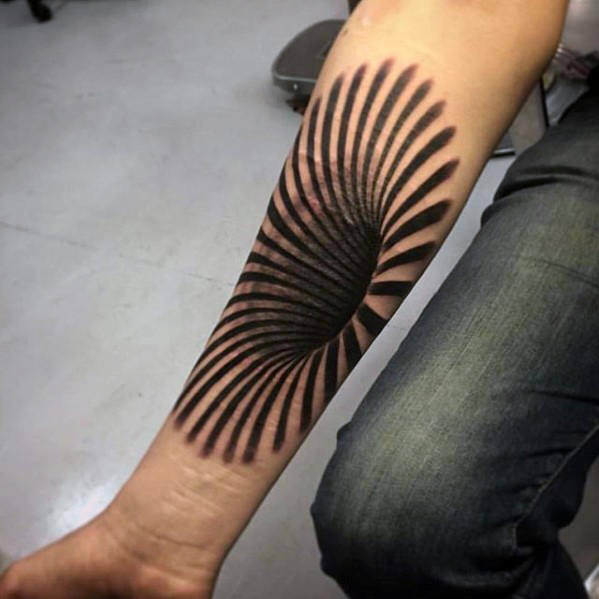 An awesome three dimensional geometric tattoo on the forearm that mimics a huge hole in space and time. 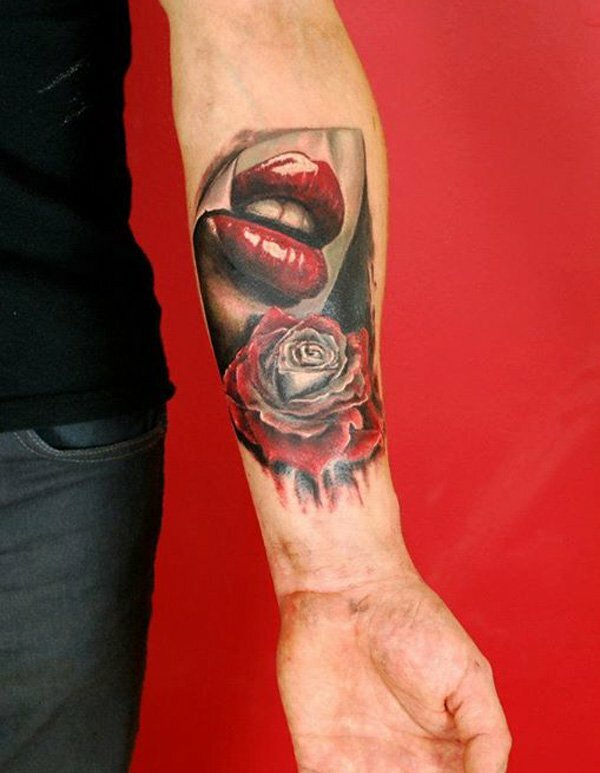 An unusual but nevertheless beautifully made three dimensional tattoo on the forearm of red lips and a color fading rose. 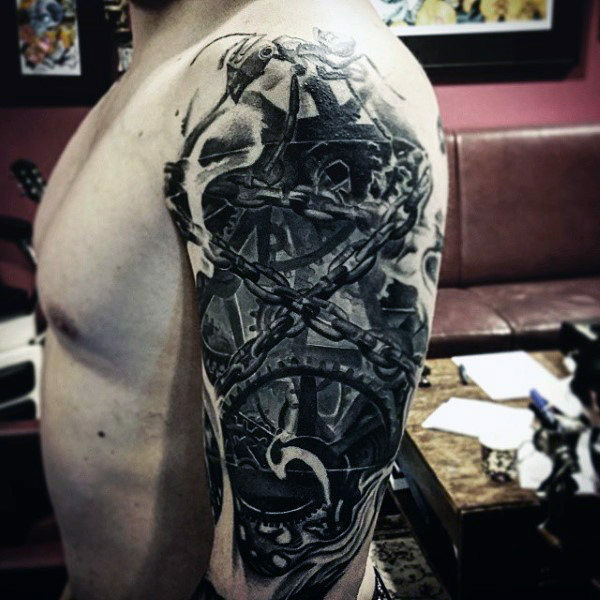 A very intricate and highly detailed three dimensional tattoo of a certain machinery made of various cogs beeing seen through ripped skin. Chest tattoos are considered to be one of the most painful tattoos out there because of the thin skin on this part of the body and its proximity to a few very delicate bones forming the rib cage. Despite this pain, a lot of tattoo artists and tattoo enthusiast prefer this tattoo placement because of the general flatness of this part of the body which makes it like a canvas. Since 3D tattoo designs are one of the most complicated and tiresome tattoo designs out there to be inked on human skin, the chest seems to be the perfect tattoo placement for this tattoo design. 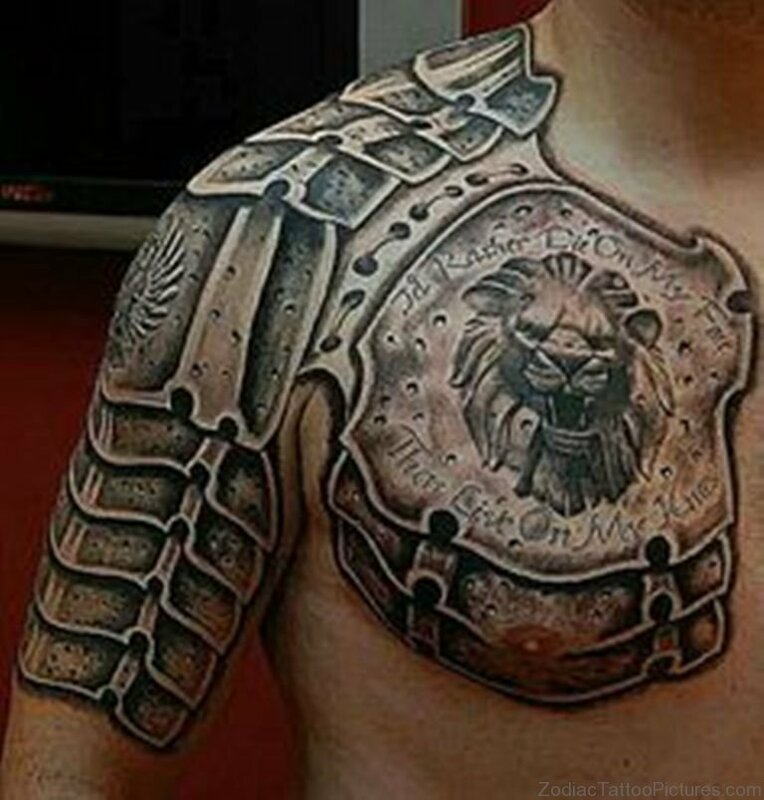 A three dimensional chest and upper sleeve tattoo of a chest plate and shoulder plate armor. 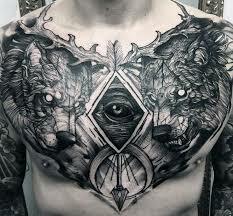 An intricately designed three dimensional wolf tattoo on the chest. 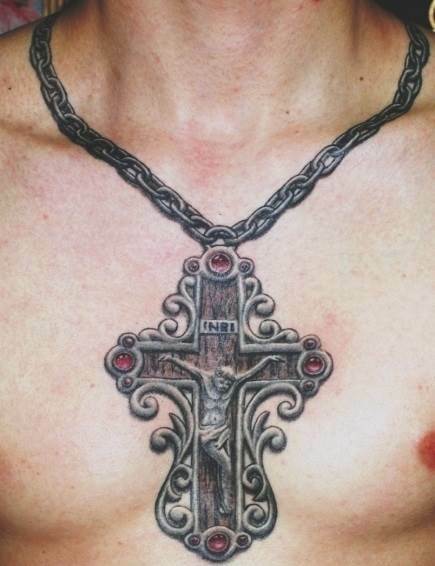 A highly detailed three dimensional tattoo of a large chain necklace with a huge cross pendant inked on the chest. 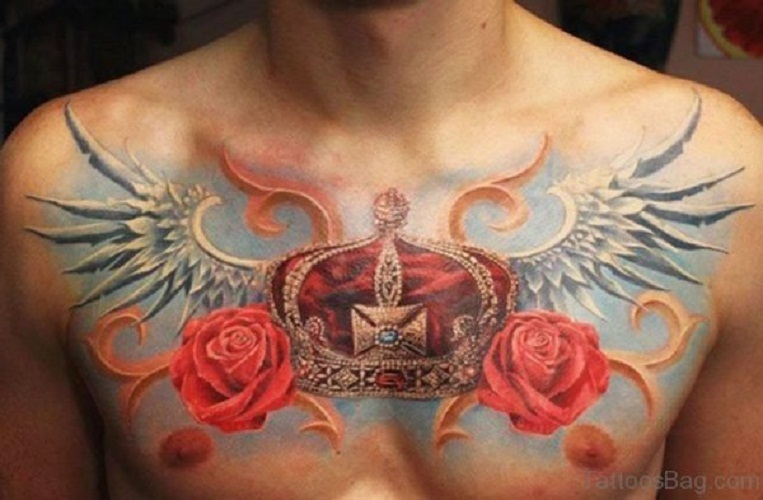 A three dimensional and colorful tattoo of a crown, wings, and roses inked on the chest. 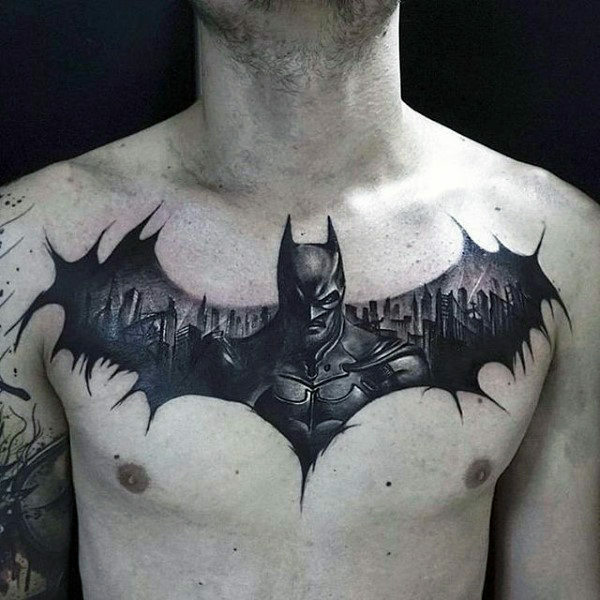 An intricately designed batman themed tattoo on the chest. Now, if you want a really large area for a really large tattoo and you honestly think that the chest is not enough, look no further than your back. The back offers the largest skin area in any part of your body and with the additional benefit of having a relatively flat surface, it is, we dare say, the most perfect body placement 3D tattoo designs. There is also an added benefit of low to moderate pain levels since the skin in most parts of the back is quite thick and has a buffer of fat beneath it. The only time you will experience unbearable pain is when you will have a tattoo that aligns with your spine. 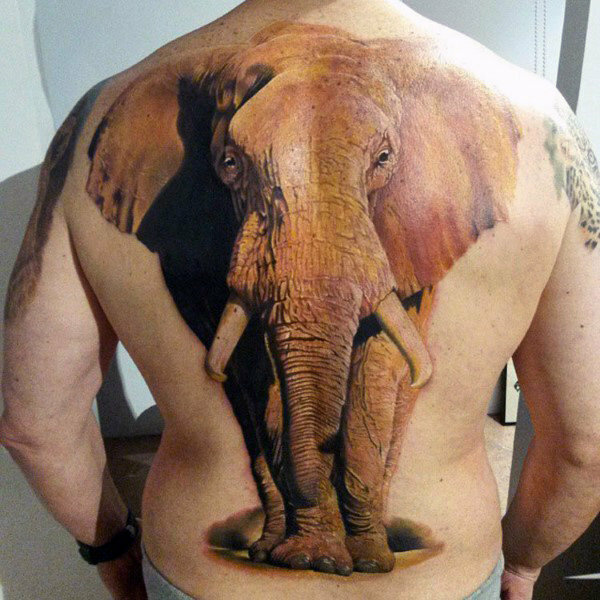 A realistically depicted three dimensional elephant tattoo inked on the back. 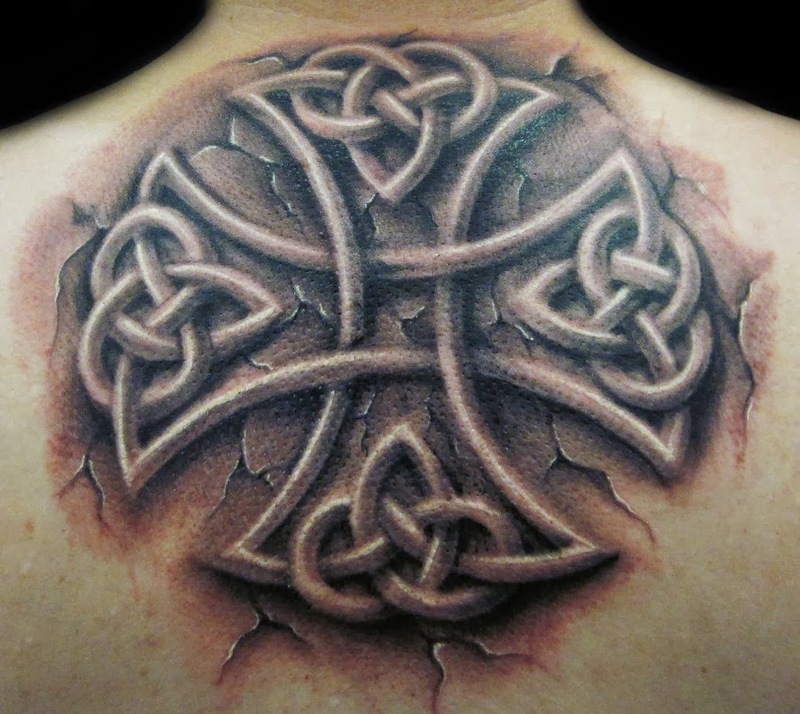 A highly detailed and large three dimensional Celtic tattoo on the back with additional cracked design elements to emphasize the three dimensional aspect of the design. 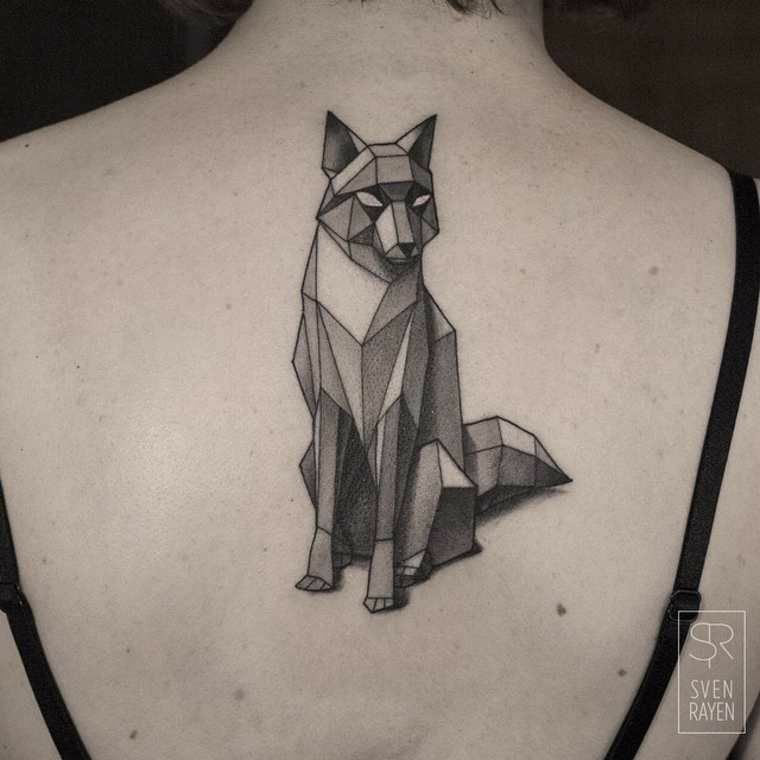 A three dimensional low poly geometric tattoo of a wolf inked on the upper center back portion of the body. 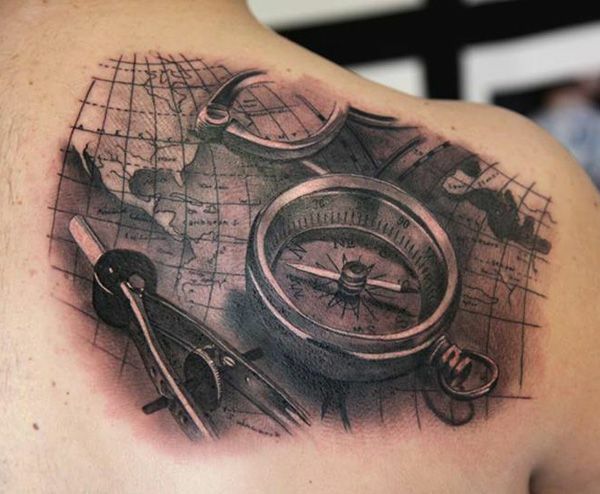 A highly detailed 3d tattoo of a compass and a map on the back. 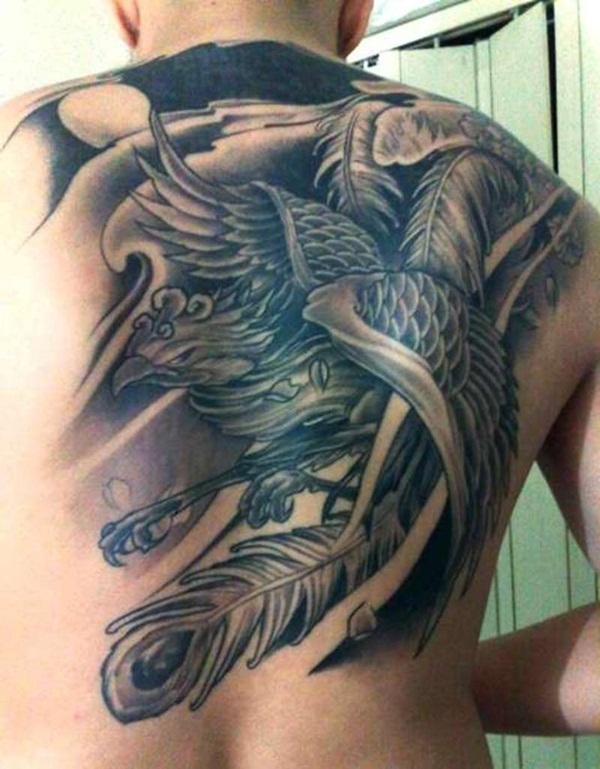 A large and intricately designed back tattoo of a phoenix with three dimensional tattoo design elements. How Painful Is A 3D Tattoo? As we always said here in Tats N’ Rings, the pain you will experience will depend on your tolerance to pain. Some may find a simple tattoo very painful while others may find it just like ant bites. Since this is one of the most intricate and tedious tattoo styles out there, the pain you will experience while inking this tattoo on your skin will be far greater than the usual tattoo designs. Add that to the long hours of the tattooing process because of various shading and shadowing elements of a 3d tattoo, you are bound to a moderate to a high level of pain.